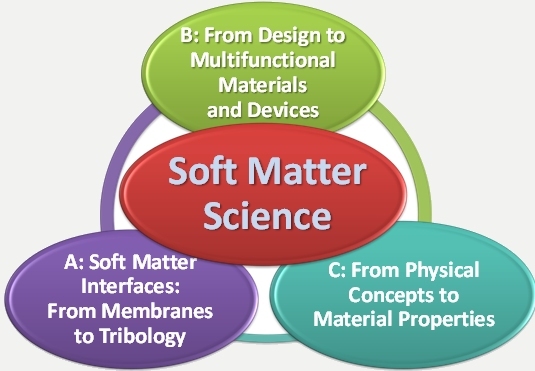 Soft matter science is an interdisciplinary field which draws on knowledge from chemistry, physics, materials science and biology. Therefore, these disciplines are represented in the research and qualification programmes of the IRTG, aiming at providing the doctoral researchers with an overview of the field, which goes beyond the specific area of their PhD thesis. All doctoral projects are elaborated by two supervisors from France and Germany. This allows not only for an international setting of the PhD thesis, but also for access to a larger pool of methods and concepts. The international setting is an added value, both from a cultural point of view and from the point of view of the scientific collaboration between different groups. Moreover, many doctoral projects involve principle investigators from different disciplines, which promotes the interdisciplinarity of the research programme. The IRTG offers a structured programme for multidisciplinary doctoral research and training in soft matter science, is well integrated into an active scientific and academic environment in the Upper Rhine Valley, and contributes to develop further the network between the participating universities. The research programme contributes to the development of functional materials for future applications. It is structured around three thematic areas, also with respect to their integrative interconnection. Doctoral researchers of the thematic area “Soft matter interfaces: From membranes to tribology” are exploring physicochemical mechanisms pertaining to the transport through membranes as well as to the adhesive, frictional and mechanical properties of (bio) surfaces, e.g. for elucidating the cellular mechano-transduction pathways and for developing innovative bio-interfaces. In projects of the thematic area “From design to multifunctional materials and devices”, researchers are designing molecular features introduced at the level of synthesis, controlling the structural organization and self-assembly through supramolecular interactions and screening the resulting materials for, and possibly also their implementation into, functional devices. Key questions of the area “From physical concepts to material properties” concern the relationship between the strength of interactions (e.g. in colloidal systems or between lipids in membranes), the rates at which changes occur (relaxation times vs. experimental time scale) and the resulting (ordered) patterns or structures. The scientific questions of all three thematic areas are intimately linked, and also have multiple methodological overlap.